Fishing grounds which face the open sea are directly affected by the wind and the waves and often get rough. 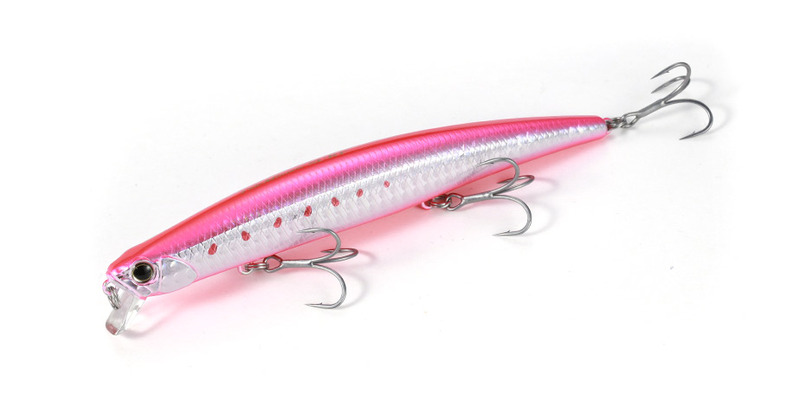 Whereas many lures tend to lose balance in big swell and strong outgoing currents, the 135 Surf was specifically designed to be used under these conditions. By stabilizing the movement of the steel ball weight with a magnet, we have realized a more active balance. Also, the steel ball is lighter compared to other metals, allowing for a quicker stabilizing response. Rather than placing a large moving weight in the body, we have used a fixed weight in the rear of the lure as its main weight. The moving weight’s counterbalancing role becomes auxiliary, creating a large lure castable even with a seabass rod. Large minnows are generally productive not only in surf and off the rocks but also in shallow rivers and over sand bars. With this in mind, we have set a shallow diving depth, making it possible to retrieve the lure dead slow while still tracing it right underneath the surface of the water.